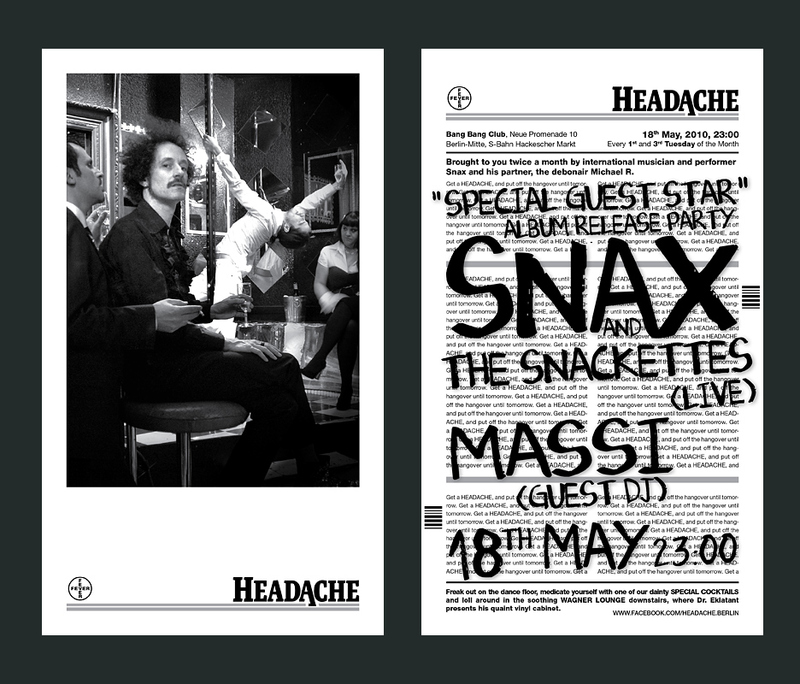 HEADACHE, at Berlin’s Bang Bang Club, pounds on this Tuesday May 18th! Your co-host Snax will also take the stage tonight with his band the Snackettes in celebration of the release of his latest album, Special Guest Star! Joining in the festivities as HEADACHE’s guest DJ is the lovely and talented Massimiliano Pagliara, tonight known as DJ Massi. Massi has released his signature cosmic disco records on such labels as Live At Robert Johnson, Balihu and Rush Hour. Get ready for some tasty, booty-shaking floor fillers from this Italian lovely. And as always downstairs in our Wagner Lounge, Dr. Eklatant returns to massage your eardrums with audible medication from his vinyl cabinet, while visual treats decorate the walls and bend your mind.